Photo: PATH. 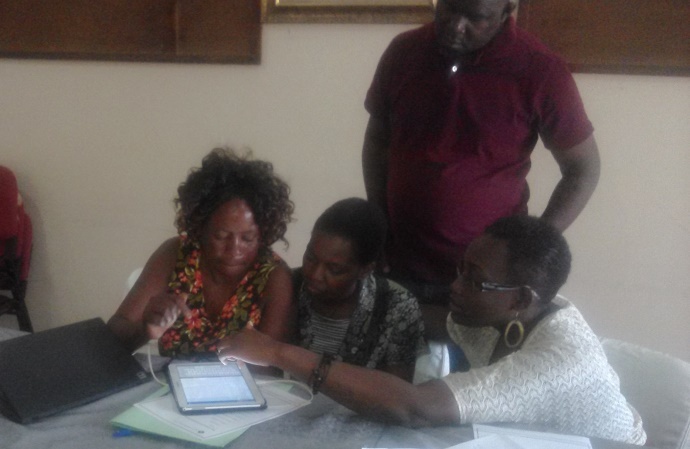 Health workers in Southern Province test the new electronic immunization registry system in Zambia. All software developers know that for a system to be truly useful, it must be accepted by the users. In February, after months of development, the BID Initiative Zambia hit the road for the first ever user testing with the User Advisory Group (UAG) to get a sense of how the immunization registry performed with the people who will actually be using it. To ensure acceptance and sustainability of the system, we asked how the users want the system to be structured. What works well in the system? What do they not like about the system? We welcomed their feedback and were pleased to hear their excitement over features in the system such as available stock on hand, notifications for children who missed scheduled vaccinations, and confirmation on if the value of the child’s weight was entered correctly. I wanted to ease his apprehension. We split the nine users into groups of three and gave each group a tablet. I could sense the excitement of using the new system, but I could also sense the group was a little uneasy about handling the tablets. To help the users overcome that discomfort, I demonstrated how to maneuver the tablet, chatted lightly, encouraging them by saying it was just like playing with a phone. We started with registering a child using imaginary data. I must admit, their imagination was better than mine! They had an imaginary child, mother, location, birthday, and weight. They were on the right track, but while they were entering the details of the child, I was imagining a queue of 50 children and was worried about the speed at which the group entered the data. I needed to be patient, but gently urged them to consider having a lot of children waiting to be entered. Soon, they picked up the pace for the registration of our imaginary children. Finally, all that remained was to hit ‘SAVE”. The first attempts were not without trial and error. In one misstep, a user mistakenly tapped on the wrong button and reverted back to the home page. This created confusion among the group on how to proceed and I encouraged them to keep trying. After a few tries, the users had mastered data entry in the immunization registry and they were comfortable with the system developed to date. New technology has a learning curve, especially for users in the health system who have been using paper forms up until now. With time and practice, new skills stick and eventually, we get more comfortable and using it becomes second nature. The BID immunization registry system is not an exception. This experience opened my eyes to how critical user acceptance is during this process. I am glad to have had the opportunity to involve the people who will be using the system and provide simple training on how to enter and retrieve data. This exercise left the group comfortable with what’s ahead as we begin rolling out the system, along with other products, practices and policies, in Southern Province in Zambia. So what language was used to develop that system, iam curious because from the time i graduated college i have been writting applications for laptops and desktops but i have never written a program for a Tablet,if this system was developed in Zambia then am a proud Zambian programmer.